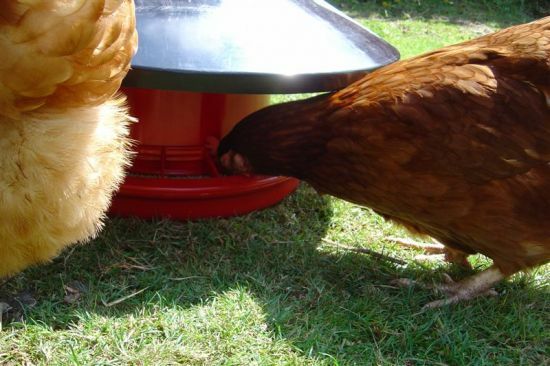 In our hens’ food, there are no artificial vitamins, amino acids or yolk pigmenters – natural ingredients provide the vitamins and amino acids which hens need for a balanced diet. There are no coccidiostats or artificial growth promoters added to the feed, so it’s as natural and as good for them and us as is possible. The ingredients of the feed are: organic wheat, soya,calcium carbonate, organic alfalfa, organic peas, wheat feed, linseed, natural vitamins, di-calcium phosphate, sea salt and marigold leaves. The hens enjoy the pellets because they contain no genetically modified ingredients, animal by-products, synthetic amino acids, artificial flavours or colours, and they don’t usemedicinal additives or solvent-extracted ingredients.